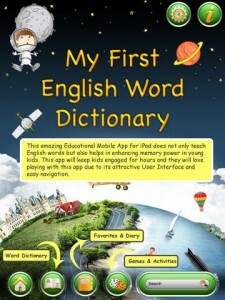 My First English Word Dictionary is an appealing educational gaming App for kids on iPad platform. This amazing English teaching gaming app is a boon for parents of young kids. Along with teaching English words, it also helps kids to improve the concentration power with integrated gaming sections in the app. This amazing Educational App for iPad does not only teach English words but also helps in enhancing memory power in young kids. It will keep kids engaged for hours and they will love playing with this app due to its attractive user interface and easy navigation. Words A to Z – This section includes over 1200 words starting from A to Z with related images to explain the meaning of the word. Favorites & Diary – This section allows kids to save their favorite words in a separate section to view later and it also has a diary section where kids can update notes and instances they come across while learning. Games & Activities – This section is the most enjoyable part of this Educational App. Below mentioned are the games and activities provided in the app for kids to enjoy along with learning. Spell Match – In this section, the app shows an image and below that there are some alphabets shown in random order. Kids can arrange them in the correct order to spell the word correctly. Cross & Match – This section is to check the understanding of the kids. Here they are shown 3 words against 3 images in random format and they can cross match it with the correct images. Listen To Learn – The App plays the sound of a word and kids can enter the spelling from what they understand by hearing the word. After entering the word, they can tap ok and the app tells them whether or not they have entered the correct word. Memory Game – This section helps to enhance memory power of the kids. The app shows inverted images and kids can try to remember the location of a particular image and the location of the word for that image and click them one after another and the images are removed from the screen. This can continue until all words and images are matched perfectly. Find Words Game – Here the App gives alphabets jumbled up and the words to be found are mentioned at the bottom of the screen. Kids need to find those words and drag to mark the entire word. So to conclude, this is a must have Educational App for iPad for Kids aged between 2 & 10 years. Do not miss the opportunity to get this amazing app for your kids to make their learning process a joyful journey.